I still have plenty of blackberries in the freezer from this autumns bountiful harvest so here is quick new recipe (nice winter warmer this one). Take a whole apple and peel and core it. 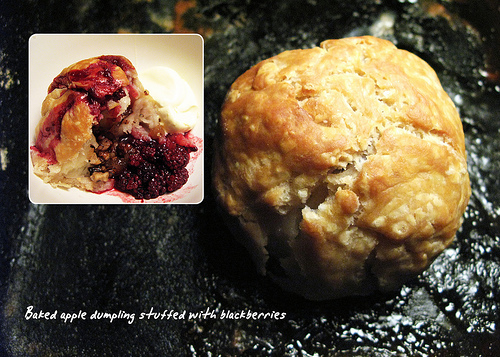 Then stuff the inside of the apple with a mix of blackberries, brown sugar and a pinch of cinnamon. Encase the whole apple with a layer of vegetable suet pastry and back for about 45 minutes at 200 C.Serve with clotted cream.